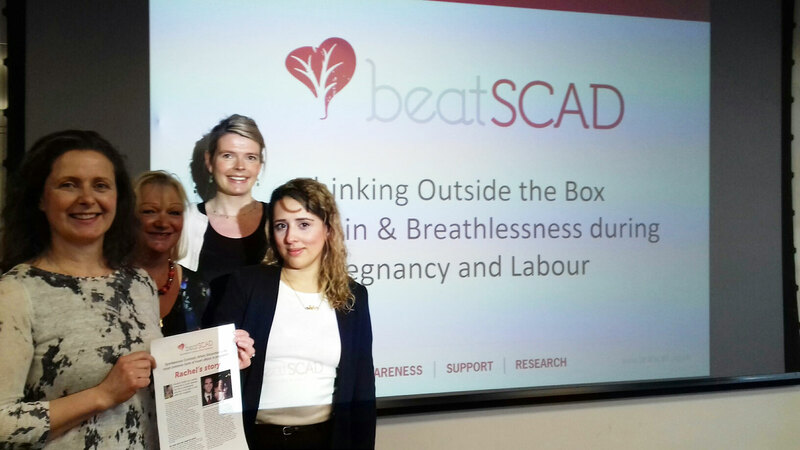 Beat SCAD recently had the opportunity to raise awareness of SCAD in pregnancy (P-SCAD) with medical staff who teach midwives. 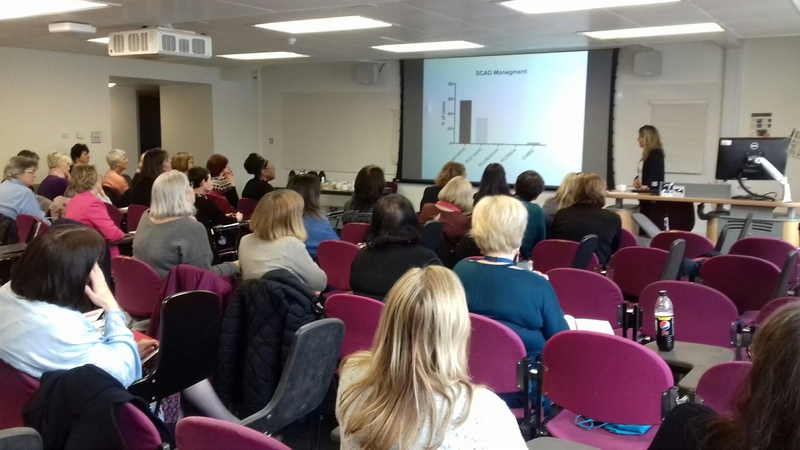 Dr Abtehale Al-Hussaini (Dr Abi), Consultant Cardiologist at the Chelsea & Westminster Hospital and Beat SCAD volunteers Sarah Coombes and Victoria Warnes-Elgie presented to a group of 40 Lead Midwives for Education (LMEs) at King’s College in London. Dr Abi discussed some of the latest research findings about SCAD and its possible causes as well as symptoms of P-SCAD. She provided information for the educators to give to their students about best practice in diagnosing and managing the condition. Dr Abi, worked on the SCAD research project in Leicester and has recently set up a SCAD pregnancy and post-SCAD pregnancy clinic at Chelsea and Westminster Hospital in London to help and advise P-SCAD patients. Although pregnancy after having a SCAD is considered high risk, the P-SCAD clinic has managed seven post-SCAD pregnancies and deliveries so far – each resulting in a safe delivery for mother and baby. Sarah told her SCAD story and talked about how SCAD patients don’t conform to the stereotypical view of heart attack patients. She urged the audience to consider SCAD if their pregnant ladies display cardiac symptoms and to ensure the necessary diagnostic blood tests are carried out as soon as possible. Many SCAD survivors have not been diagnosed quickly, often being told they are ‘anxious’, and as a result have suffered major heart damage (see our P-SCAD case studies). Sarah also explained the work Beat SCAD does to increase awareness of the condition, support survivors and raise money to fund research. SCAD survivor Victoria had a SCAD in April 2017 and told her story to the midwife educators. “It was fantastic to have the opportunity to engage with the country’s lead midwife educators. I was able to describe the very subtle symptoms that I experienced, and discuss other survivor stories, which will hopefully now empower midwives to interrogate any kind of chest pain further, speeding up the diagnosis of SCAD, preventing long-term heart damage and potentially even saving lives,” said Victoria. The presentation was very well received and the audience really appreciated hearing directly from SCAD patients and to know there is now a P-SCAD clinic they can refer patients to. The LMEs will now be able to disseminate information about P-SCAD to their students, raising awareness of SCAD across the country. Many thanks to the LMEs for inviting us to talk at their event. 30 intrepid cyclists are embarking on an incredibly hard 300-mile ride from Barcelona to Béziers across the Pyrenees on 4-6 May to raise money for Beat SCAD. The 2018 One Community Charity Cycle ride includes representatives from across the M25 community, including Highways England, Connect Plus, Connect Plus Services. The cyclists are training hard for this mountainous route where they will be climbing more than 20,000 feet in the first two days, including riding through the Col de Pailhères, a 20km pass averaging a 7% gradient. Beat SCAD and SCAD patients are very pleased and excited that the charity was chosen and we look forward to hearing about the progress of the cyclists along the route!